1. Explain what is OpenStack? 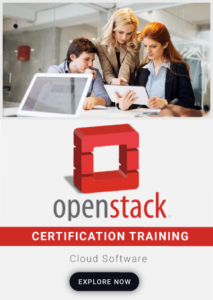 OpenStack is a set of software tools for managing and building cloud computing platforms for private and public clouds. It’s a free and open source software cloud computing platform. 2. Mention what are the three components that make modular architecture of OpenStack? 3. Give an overview of OpenStack Services? OpenStack offers services like Keystone: Provides authorization and authentication for users Glance: Manages images in different formats Cinder: Provides persistent block storage Neutron: Enables users to create and attach interfaces to networks Nova: Provides instances on user’s demand Swift: Storage platform integrated directly into applications Ceilometer: Openstack for billing Heat: Allows automated infrastructure deployment. 4. Explain what hypervisor is and what type of hypervisor does OpenStack supports? 5. What are the two types of storage does OpenStack Compute provides? OpenStack provides two classes of block storage, Ephemeral Storage: It is associated with a single unique instance. Based on the instance, the size is defined. When the instance associated with it is terminated, data on ephemeral storage ceases to exist Volume Storage: This storage is not dependent on any particular instance and is persistent. Volumes are user created and within Quota. 6. What are the basic functions of Identity Service in OpenStack? The basic functions of Identity Service is User Management: It tracks the users and their permissions Service Catalog: It provides a catalog of available services with their API endpoints. 7. What are the main components of identity user management? Users: It is a digital representation of a person, service or system who uses OpenStack cloud services Tenants: A container used to group or isolate resource or identity objects. Depending on service operator a tenant may map to a customer, account, organization or project Roles: A role includes a set of rights and privileges. A role determines what operations a user is permitted to perform in a given tenant. 8. Mention what are the networking options used in OpenStack? The networking options used in OpenStack are Flat Network Manager: IP addresses for VM instances are fetched from the subnet, and then injected into the image on launch Flat DHCP Network Manager: IP addresses for VM instances are fetched from the subnet specified by the network administrator VLAN Network Manager: Compute creates a VLAN and bridge; DHCP server is started for each VLAN to pass out IP addresses to VM instances. 9. What is the meaning of term “Cinder” in OpenStack service? For handling persistent storage for virtual machines, OpenStack provides the service referred as Cinder. There are multiple backends for cinder. The one that is utilized by default is LVM, called Cinder-Volumes. 10. List out the storage locations for VM images in OpenStack?